When it comes to speeding up a website by caching data we would talk about any other type of website, but an online store. This is due to the fact that online stores are very sensitive to caching. They offer dynamic content which is generated based on a particular user and process sensitive information such as personal data, payment details and others. This data shouldn't be cached at any point since it might become accessible for all of the store’s visitors. But speeding up by caching means that the website will be much faster in peak bandwidth moments due to a bigger number of visitors. Therefore online stores are the ones needing the most such type of support. Is your store ready to handle more visitors during the upcoming Black Friday and Christmas holidays? Besides providing sufficient server resource and optimizing the system there is one more measure you can take to enhance your store’s performance. Speeding up by caching is still possible for online stores especially when it comes to a ready-made CMS such as WordPress using WooCommerce. 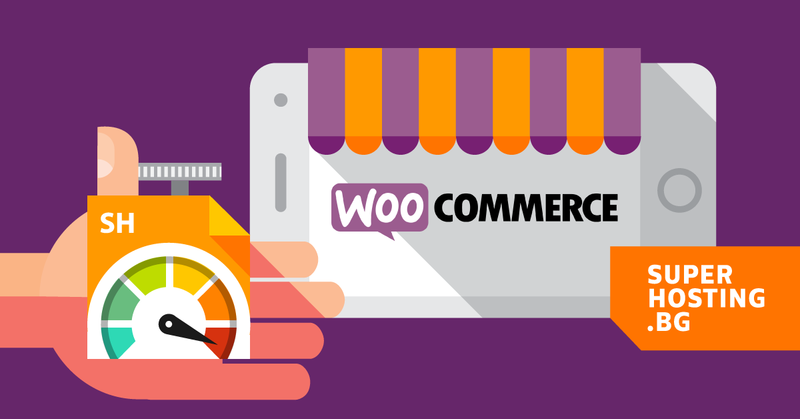 WooCommerce supports different caching technologies and systems operating on different levels. The only thing you need to do is set them up properly so that caching is not performed for the sensitive store areas such as the shopping cart, payment page and the customer account. The first acceleration level is achieved by using technologies such as Memcached and Redis that are enabled on application level through an additional WP plugin. The second acceleration level is achieved on the web server level as it not only speeds up the store’s loading, but also drastically reduces the server resource usage. For the hosting service this means the CPU resources, RAM and all others related to them. One such system for speeding up on a server level, built-in through our custom developed SuperCache tool for cPanel is already available for the SuperHosting plan and all Managed VPS services. SuperCache is a Web Accelerator which caches the whole source code of a page as this includes both static and dynamic content. Unlike Memcached or Redis which work on application level, SuperCache is operating in front of the real server where the website is hosted. The tool caches the final page version after all generation processes such as database queries and PHP script execution have finished. Caching data which means saving it by SuperCache for future purposes is performed on a web server level in front of the source server. All upcoming queries for this page are processed by SuperCache without sending any queries to the source server. Once cached, the webpage starts loading with the speed of a static HTML page as the acceleration might be measured in times. Loading cached pages through SuperCache does not require running PHP processes in the hosting account, neither execution of queries to the database. Faster loading as this leads to many advantages for the store. Better ranking in search engines; more satisfied users with more positive attitude to making purchases. Enhanced durability during peak bandwidth moments when users are still just browsing products. For example, in rush hours and higher load times such as Black Friday, SuperCache can handle and neutralize the traffic generated by many visits which still haven't been converted to purchases. Decreased resource usage by the online store. Fewer queries to the database, fewer simultaneous PHP processes running and fewer CPU minutes. SuperCache can be activated and configured for each and every website no matter if it is a blog, news website, large portal or another. But when SuperCache is activated for an online store it is very important to pay attention to the proper settings and configuration as this means a developer might be the best choice of a person to do this. WooCommerce supports caching technologies whose normal operation requires minimum efforts while configuring. In SuperCache’s settings you need to protect the sensitive store’s areas such as the shopping cart, payment page and the customer account. If you have already installed other WordPress plugins, additional SuperCache settings may be required. To set up SuperCache correctly, follow the steps in the article How to Set Up SuperCache for WordPress. Do not activate SuperCache and do not test its settings directly into the real online store. Make a copy of your store and then perform all the necessary tests on it. Setting up SuperCache correctly through the Advanced Settings section requires in-depth knowledge of your website’s operation such as the types of cookies and HTTP headers that are generated to its visitors. We recommend that you leave the SuperCache configuration to the system developer or at least to a person who knows how a website works.